An entire satisfying meal in one bowl! 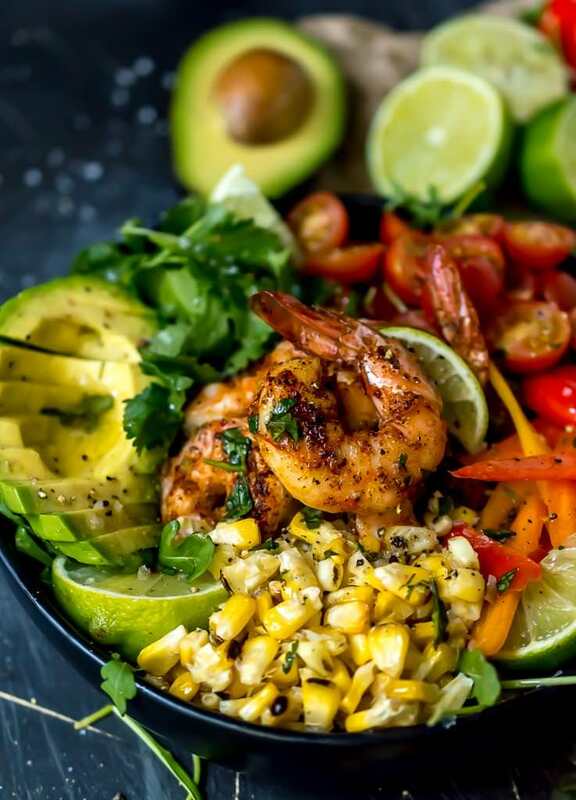 This Spicy Shrimp Bowl has flavorful shrimp, grilled corn, tomatoes, avocado, cilantro, lettuce, arugula, mini peppers and a cilantro lime dressing. This fiesta bowl shrimp salad is great for a quick weeknight dinner or for meal prep. 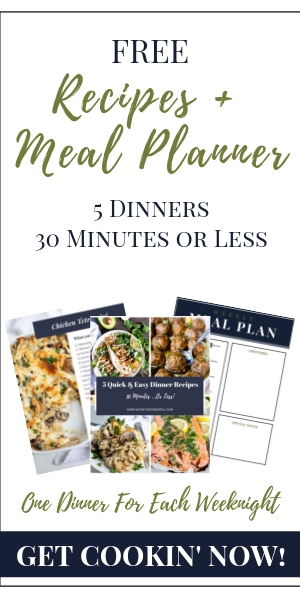 This recipe has Whole30, Paleo compliant options, is gluten free, grain free and dairy free. This is a great alternative to extra cheesy, carb-loaded, chips-n-salsa goodness when you’re craving Mexican food. The fresh flavors and bright colors make this an unforgettable meal! I do love my shrimp, especially when they are baked in the oven like these. This recipe is adapted from my Cilantro Lime Spicy Baked Shrimp. I also love Avocado Shrimp Salad and Lemon Dill Shrimp Zoodles for quick and easy dinners. What type of shrimp should you buy? Always buy wild-caught for the best texture. Shrimp is something I splurge on. I find that the discount shrimp is almost inedible. As far as size, get the size that you prefer. Just keep in mind that smaller shrimp will take less time to cook. How do you know when baked shrimp are done? Like any other way of cooking shrimp, look at the color and shape. Shrimp will have a pink hue and be curled into a loose ‘C’ shape when done. You will need a Citrus Juicer for the limes, a Rimmed Baking Sheet for the shrimp and a good sharp knife for prepping all of the veggies. I use these Chef’s Foundry Ceramic Knives and LOVE them! What else can you serve with these Spicy Shrimp? This salad is very satisfying. But if you feel like you need a little more substance and grain/carbs are not an issue, serve with rice or tortillas. If making this for meal prep, prepare everything but the avocado slices. That should be done as close to serving as possible to prevent browning. Don’t have fresh corn? Toast some frozen corn in a fry pan as an alternative. If you are not that into shrimp, this salad is great with grilled or baked chicken too! 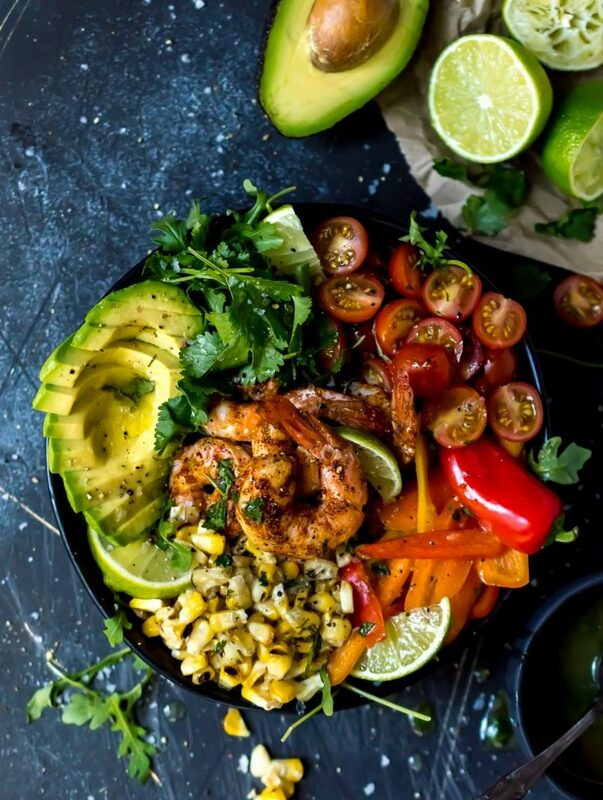 This Spicy Shrimp Bowl has flavorful shrimp, grilled corn, tomatoes, avocado, cilantro, lettuce, arugula, mini peppers and a cilantro lime dressing. 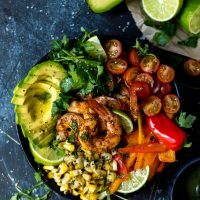 This fiesta bowl shrimp salad is great for a quick weeknight dinner or for meal prep. Preheat oven to 400°F Rinse and Drain thawed shrimp. Toss shrimp with oil and spices. Transfer to a rimmed baking sheet. Bake 8-10 minutes (depending on size) or until shrimp are pink and in a loose 'C' shape. Whisk all dressing ingredients for 1-2 minutes. Top arugula/lettuce with tomatoes, roasted corn, sliced mini peppers, limes, cilantro, shrimp, and avocado. Drizzle with dressing.